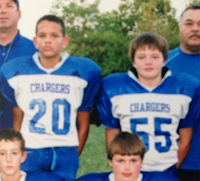 While looking at this picture of Derek and Morgan in their Chargers' uniforms, it made me realize something. I knew absolutely nothing about a young man that I have watched play for years. This set me on a path to learn more about Morgan. I started asking Derek and Morgan a lot of questions and the more I learned, the more I wanted to know. Below is a compilation of those efforts. You and Morgan Willcox are no strangers to being athletic leaders on the same field. Where and what grade did you first start playing football together? We started playing football together in the 6th grade for St.Ann/St. John. We were the starting running backs. Morgan displays great leadership qualities. How important is he to the success of this team and why? He is a very important asset to this football team. Not only is he a great, explosive football player, but is also a great leader with impressive intelligence. How has Morgan positively influenced and/or impacted you personally that has resulted in you improving your skills and/or work ethic? Morgan has personally impacted me by being a great example of a great student athlete. Best lifting numbers on the team along with a 30+ ACT? That's crazy. If you had to sum up Morgan in a single word, what would it be? If I had to sum him up in one word, I wouldn't. I'd describe him in two: work horse. He puts in 102% effort in everything he does, and it shows. What are a few descriptive words that you could give me to sum up who Morgan Willcox is? Driven, Intelligent, Strong-willed and Leader are a few. I have watched you play football for many years. What drives your passion for the game? I love to compete. I'm just a naturally competitive person, and the best athletes compete in football. There's just nothing that quite comes close to how it feels to play on Friday nights. What is your philosophy on preparation and training and what have you been working on to prepare for your Senior season? You just have to work as hard as you possibly can. I mean you really have to go in to train with the mentality that when you're done, you can hardly move from working as hard as possible every second you're there. Personally, I've been working on getting quicker, faster, and catching in order to prepare for this season. I am told that you are one of the strongest players on the team which obviously goes hand in hand with your philosophy on preparation and training. With that said, how much do you bench? Well, my best max out this year was 360 lbs. What motivates you to strive to be successful on the field? My competitiveness, and how much I hate losing. I just can't stand to lose, so if I'm going to do something, I'm going to do everything I can to win. What motivates you to strive to be successful in the classroom? My parents have always pushed me to be successful in the classroom. And I realize that football might soon be over for me, so I need to prepare for my future and being smart opens so many doors to being successful in life. What do to plan on majoring in and why? I'm not entirely sure yet, but I think I want to major in engineering. I'm a math and science guy, so that stuff seems interesting to me. Back to football, what position(s) will you be playing this year? Y, which is like a tight end, and maybe some linebacker. Talk about your relationship with your teammates, coaches and what you feel will be special about the upcoming season? I think that this year, we've got a real special group of guys with the right coaches to really unlock our true potential. We've had pretty talented teams before, but this year the team is pretty high up there. We're all working as hard as we can to prepare for week one. Lastly, what is one word or phrase that as a team leader that you want every single one of your teammates to be thinking about heading in to this season? "4-6"
That's right Lancer Nation, your team ended the 2012 season with an abysmal 4 W's. Morgan said, "I think that was the first year I had ever had a losing record in nearly 11 years of playing football". Morgan wants his team to be thinking about that record so they never forget the pain, and the let down, and the heartbreak that he and his brothers shared. As Morgan mentioned in the interview, "we've had pretty talented teams before, but this year the team is pretty high up there". Morgan is a leader with a very high IQ. He is mature enough to understand that hard work beats talent when talent doesn't work hard. This year, the Lancers have the talent. This year, the Lancers are working until they can hardly move. 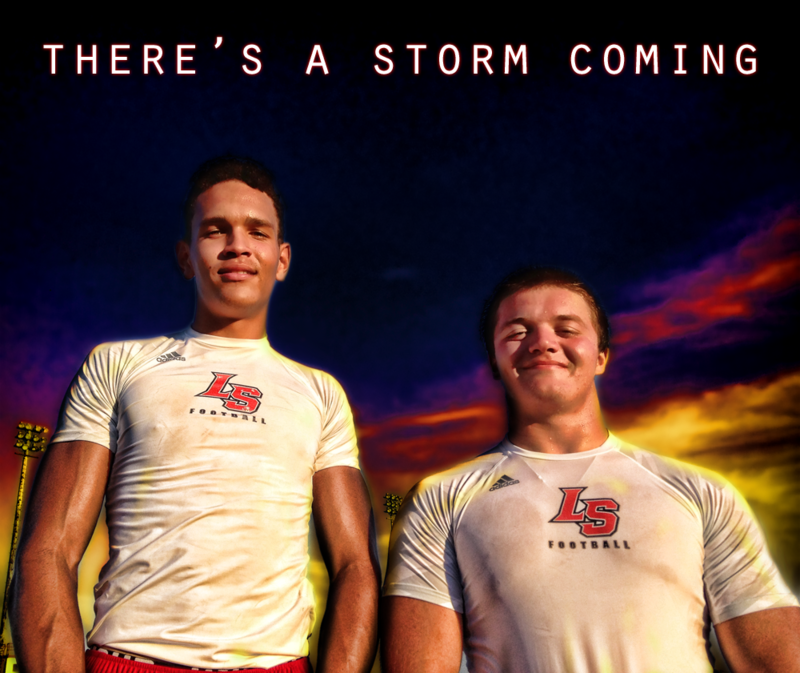 This year, the entire Lancer Nation will witness.